Our client can avail from us Vacuum Drying Autoclaves. Each and every aspect of these industrial plants is paid meticulous attention to make them in compliance with international quality standard. Our Vacuum Drying Autoclaves are designed and manufactured as per the specifications provided by our clients. We have the capability to manufacture high performance autoclaves which increase the efficiency and performance of any plant. 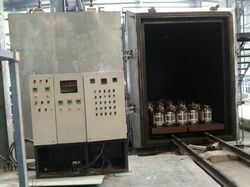 This equipment comprises a vacuum autoclave in which a cylinder containing a piston is situated at one end and can be closed at the end by a hollow piston containing a condenser casing. The cylinder is evacuated through a port and the piston is lowered to close the port immediately an injection valve is opened to fill the cylinder with an impregnating substance. When the injection valve is shut the piston slowly presses the impregnate out through the neck of the condenser casing. The pressure is increased till the ejection valve opens. A blast of gas cleans the cylinder to remove any remaining impregnate. Looking for Vacuum Drying Autoclaves ?